For the decadence pictured here, Sellman starts with peanut butter balls dipped in chocolate, also known as buckeyes. 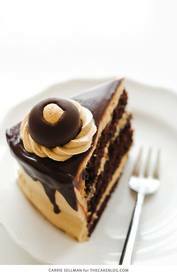 She then bakes three layers of rich chocolate cake and frosts it with peanut butter buttercream. Then comes the chocolate ganache, and then the rosettes piped on top to hold the buckeyes in place. Phew! I, of course, tempered my chocolate for the Buckeyes, as can you! Tell us how this came out for you!